Over the next decade a vast quantity of remotely sensed data and in situ data will become available for climate studies. 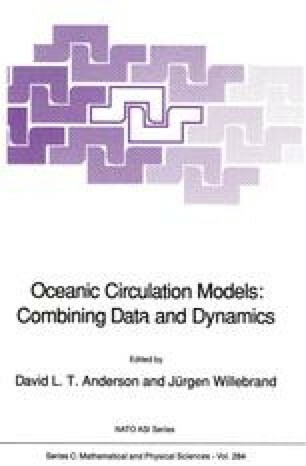 To gain maximum benefit from these large heterogeneous datasets, it is essential that they be quality-controlled, interpreted into directly measurable quantities, and then synthesised into a consistent description of the time-evolution of the atmosphere and ocean. Operational Numerical Weather Prediction (NWP) centres have developed considerable scientific insight and technical skill in problems of this kind. Experience in NWP has shown that the quality control and the interpretation (or inversion) procedures for remotely sensed data are considerably sharpened if all available a priori information, including current and earlier observations, are brought to bear on the interpretation of the new data. This idea is implemented in NWP centres in the form of four-dimensional assimilation systems. Based on experience with FGGE and TOGA, it is clear that there will be a strong demand for the production of timely gridded III-a analyses of all the World Climate Research Programme (WCRP) data. The efficiency of the observing systems, and of the scientific work, will be considerably enhanced if the remotely-sensed WCRP data (preferably at level 1 or 1.5) is delivered to NWP centres in real time.